At the end of this evening, which lasted for more than an hour, Marwa signed some of his Diwans and books for the audience The gathering included media persons, literary aficionados and friends and fans of the writer. 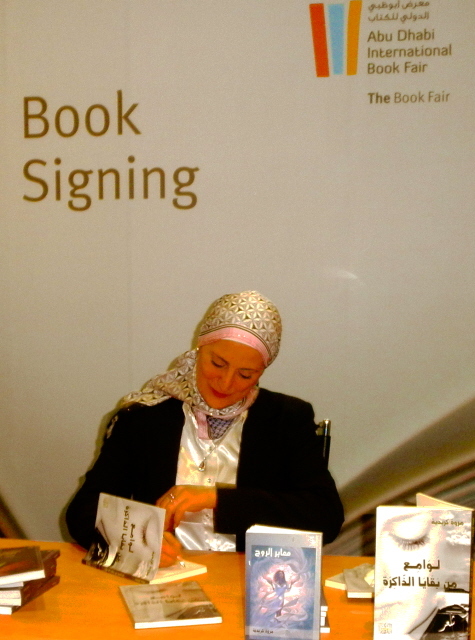 Marwa Kreidieh is a writer interested in humanitarian issues and non-violence. she uniqueness lies in the fact that she questions political and social relations in the existing multi ethnic groups, religious groups, geographically based groups, and has worked in the fields of intellectual variety, and has contributed many literary works and fine art with poetic thoughts and also researched in the field of political sociology. 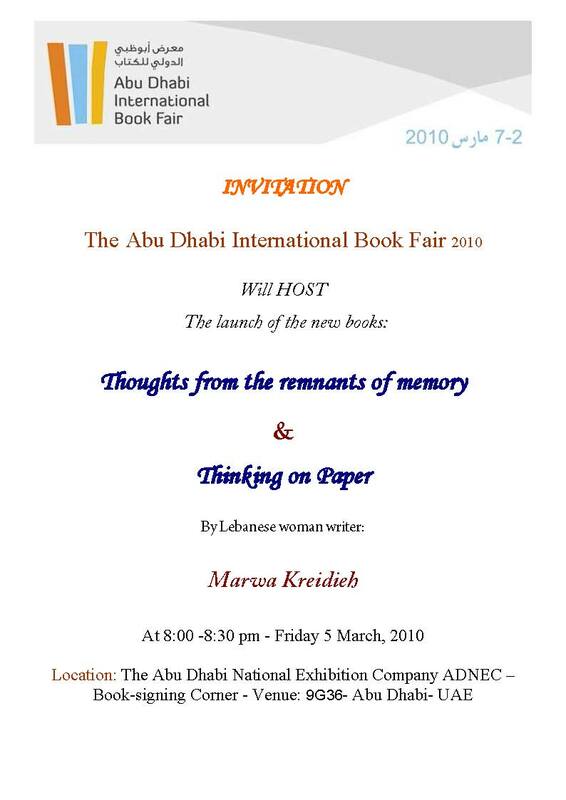 The Abu Dhabi international book fair 2010 will host young Lebanese woman writer Marwa Kreidieh on the occasion of the launch of the new books: “Thoughts from the remnants of memory” &”Thinking on Paper” At 8:00 pm next Friday 5 March in The Book-signing Corner, Venue: 9G36 The new books reflecting the author deep anxieties about the present they live in and offering alternative and even rebellious perspective on the contemporary situation in the world. Marwa Kreidieh, a strong opponent of violence in all its forms and ideological moorings, has said her book, “Thinking on Paper “is an attempt at questioning the received wisdom on different aspects of life in our times, including religion and culture. The books, published by The Al Dosari for cultural And Creativity, Kingdom of Bahrin, are a collection of creative writings that defy easy categorization. Marwa Kreidieh is a writer interested in humanitarian issues and non-violence. she uniqueness lies in the fact that she questions political and social relations in the existing multi ethnic groups, religious groups, geographically based groups, and has worked in the fields of intellectual variety, and has contributed many literary works and fine art with poetic thoughts and also researched in the field of political sociology.